What is a farm girl from California doing at GDS? Well, apparently, quite a lot. At the end of my first month on the job as a product manager, I wanted to share a few observations from a newcomer’s perspective. On my team, we’re working to bring peace of mind to citizens with GOV.UK Notify. This platform helps service teams across government to send text messages, emails or letters to their users, making it much easier to keep people up to date. This is the first time I've had the privilege of working so closely with a team of talented developers, designers, and user researchers. In contrast to my previous experience working with teams based off-site, or even overseas, I feel having face-to-face conversations with colleagues improves the level of communication tenfold. 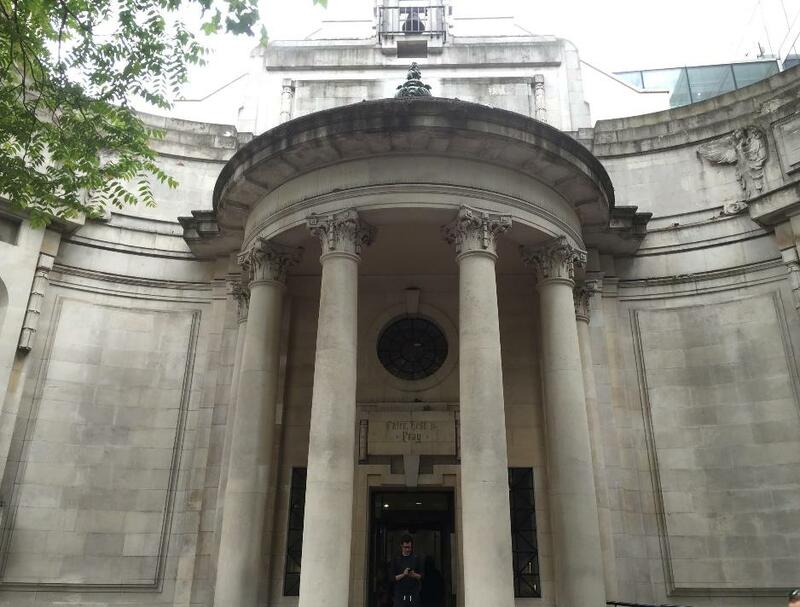 When I first came to Aviation House for my GDS interview, I immediately felt like this would be great place to work. One tangible benefit is the warm, open work environment encouraged at GDS. This is something I was seeking when I began my job search. So far, I certainly feel ‘at home’. 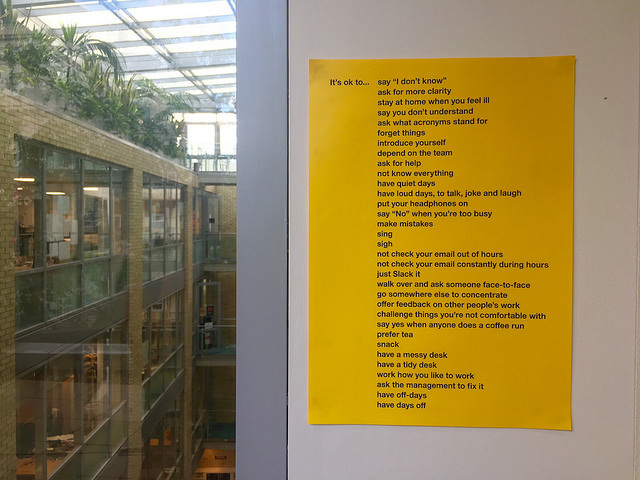 The bright yellow posters that recently appeared around the building might also help explain why I already feel so comfortable at GDS. These are designed to let new recruits like myself know what is ‘ok’ in GDS culture - from singing at work, to not checking email out of hours. To me, they represent 'non-judgemental advocacy’; giving employees the freedom to be themselves. These guidelines are also useful when you’re confronted with situations that could be a little daunting for a new recruit. For me, it was my team standups, when our developers share the details of their daily tasks. As a product manager who's still learning about the tech side of things, 'it’s ok' means I’m free to ask as many questions as I need to, without fear of judgement. At first, the pace of life at GDS felt a little slower than what I was used to in the private sector. But, on further reflection, it struck me that the pace at GDS was just that - paced out. My previous experience in a commercial setting and before that, as a freelancer, meant that my schedule was often rushed or erratic. This steady flow of work allows me time to think and respond to issues properly. Before, I'd often find myself just reacting to them. And, I’m already seeing a difference in the quality of my work. Reflecting on all these positive aspects of GDS, I wonder, have I arrived in a role that offers real work-life balance? Can I really just go home and think about what I'm going to whip up for dinner, or even a weekend sailing trip, instead of worrying about my work all evening? My journey to GDS really began about a year ago, when a friend and fellow General Assembly veteran said to me, “Oh, you’d do well to land a job at GDS. It’s the perfect place to learn, mature, and really see what product management is about”. His words have echoed ever since, and when, after several applications, I was finally offered a role at GDS, I accepted right away. Throughout my career, I’ve constantly found myself chasing goals. But sometimes, I wonder if I’ve forgotten something important: to enjoy myself along the way. Ironically, this realisation has come to me only after I’ve reached another milestone - the goal of landing a role at GDS. And, as I take time to reflect on how hard I worked to arrive here, I’ll make sure to savour this new journey. Follow Fajer on Twitter and don't forget to sign up for email alerts. And if you’d like to join us, we’re recruiting. We’re always on the lookout for talented people to join the team so take a look at our videos describing how we work, our vacancies page, or drop us a line.